Thanks for the thorough examination and realizing that I had leg length difference of 10mm. I took your advice after getting the prognosis by you and seeing the x-ray verifying the 10mm. Being a marathon runner in the 1990's, I could not avoid getting repeatedly injured and did not know what to do. After getting examined by my doctor who did an x-ray in 2000, I was referred to a few physical therapists and tried laying off running for 3 – 12 months at time after any injuries. Even after training a fraction of my previous mileage, I still became injured. The last few times were in 2007 and 2008. After getting a lift, 5/16", done on my running shoes in 2009, I have been injury free ever since and have increased my running mileage back up to 45 miles per week. I need to do a 16-mile long run once per week to have enough stamina to finish a marathon. I have done 20-mile training runs with no problem. I have done other things like stretching after every run, lift weights twice per week, do some Yoga and Pilates, and eat better too. But the one thing that made the difference was biomechanics, not being off-balance, and putting stress on my body. Starting at the feet, to the knee, to the middle core and hips, and neck! Thanks for being an alternative to standard western medicine and letting me enjoy what I love to do, running. I recommend seeing Hanna for running injuries, pain, and getting to the root of the problem. Make her a solution for many health issues. The benefits of running- such as weight control, regulating blood pressure, and bone density -must be carefully weighed against the risks and negative effects it may have on the joints of the body. 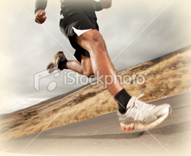 According to Sports Medicine, Nov. 1992, about 40 % of runners in the US suffer from injuries related to running. Most frequently, runners we see have complaints of hip pain. Runners developing hip pain are usually diagnosed with bursitis, IT band syndrome, clicks in the joint, or hamstring injuries. All these pain conditions are typically a repetitive motion injury, or may be caused by imbalanced pressure in the joint. Due to the angle of the hip joint, the hip muscles are well placed to absorb most of the body's shock when it impacts the ground during walking or running. Repetitive motion and excessive strain on these muscles results in tightness and increased pressure into the hip joint, which may be the main reason for runner's hip syndrome, or hip pain complaints of non-athletes. If the hip pain is symmetrical (on both sides), the cause of the pain is usually tightness in the joints from too much movement and not enough stretching, or stiffness from lack of movement. If the pain is felt mostly on one side of the body, improper biomechanics (movement patterns) are causing the shock-absorbing muscles on one side to work harder, leading to pain. A much more common explanation for one sided hip syndrome is an existing leg length inequality (LLI), which would result in asymmetric weight bearing and increased pressure. The reason a leg length difference causes such a problem has to do with how the head of the femur moves in the hip socket, especially while running. When a person has a leg length difference, the head of the femur is compressed in the socket on the higher side and moves laterally, decreasing the weight bearing surface and increasing pressure and wear of the socket (acetabulum). This is why it is common to have more problems and less flexibility on the longer leg side. However, on the short side there is a higher impact force into the joint, compressing the muscles around the hip joint with each step, which leads to diminished shock absorption and the development of trigger points and referred pain, creating a host of nasty pain syndromes like pain andnumbness down the leg, into the groin and across the hip. Paul St. John, the originator of Integrative Neurosomatic Therapy, has been educating health care professionals in the principles of structural balance and postural alignment for more than 25 years. Hanna Franke, owner of the Neuromuscular Pain Clinic in Madison and one of his seminar instructors, has been treating chronic pain conditions for over 20 years. At our clinic, the first thing we do is an evaluation of the entire body to understand and explain the soft tissue causes of the pain. We thoroughly investigate pain mechanisms causing soft tissue pain, such as: Ischemia (constricted muscle tissue), Nerve Entrapments and Compression, Trigger Points, Postural Distortion, and Biomechanics. The assessment of a person's alignment combined with precise and specific manual therapy techniques, has allowed Hanna Franke to resolve pain conditions that have eluded other health professionals. Her associate, Laura Novak, a Massage Therapist with a varied background, adds a host of massage modalities to complement the structural approach. A "Hitch in your Giddalong..."
A successful game of Golf and the power of your swing are closely related to the fluidity of your joint movements and the flexibility of your elastic rod - the spinal column - in your body. Most improvements in the game of golf are achieved through cutting edge technology, new techniques and a different coach! Hanna Franke, Certified Neuromuscular Therapist, and her trained staff, is such an analyst! At the Neuromuscular Pain Clinic in Madison we analyze you for structural imbalances, posture and gait patterns and then devise a treatment plan to correct these sources of pain, stiffness of the body and lack of mobility. Neuromuscuar Therapy (as developed by Paul St. John) consists of a series of Massage Therapy sessions specific to your complaint, decompression of joints, cranio-sacral synchronization, cervical mobilization and the correction of leg length imbalances if appropriate. According to recent research, approximately 90% of pain symptoms are considered idiopathic, which means no known cause. We believe the reason there is no known cause is that a proper investigation of soft tissues (muscular system) and alignment (postural distortion) is not being performed. for Golfers to facilitate integration of structural and muscular systems, allowing for fluidity in the body and more ease of movement. A free assessment (1/2 hour) is offered with your initial session!